Samsung's latest phone is a spendy piece of hardware. While it's essentially a Galaxy S8 Plus with a stylus, that still means it's a great phone. The phone is available unlocked and from all the major US carriers, and everyone is offering deals to entice you—the deals are important when the phone costs almost $1,000. So, let's break it all down so you can figure out how many piggy banks you'll have to bust open to gather the necessary funds. Over on Samsung's website, you can snag the unlocked phone or one of the carrier versions. You're probably going through Samsung to get the unlocked one, though. That phone will run you $929.99 paid all at once or split up over 24 months. Ordering from Samsung gets you either a Gear 360 camera or a 128GB microSD card and fast wireless charger combo. You can lower the price of the phone by trading in an old device, which could be valued as highly as $300, like the Note 5 or iPhone 7. Even some older phones are apparently still in the $300 group including the LG G4 and G5. Over at T-Mobile, you can get a buy one, get one deal on the Note 8... sort of. There are the usual caveats; the phones must be purchased on a monthly payment plan up front. However, T-Mobile can only finance a maximum of $720 per phone, and the Note 8 is $930. So, you need to pay $210 on each device as a down payment. Next, you have to use the T-Mobile promotions site and enter code 17SAMN8BOGO to register for the deal. Several weeks later you'll get a pre-paid MasterCard with $930 on it, which is enough to pay off one of the phones and reimburse you for the down payment. The Samsung bonus bundle is a thing here, too. The AT&T version of this phone is a bit more expensive at $949.99, but you've got two promo options. There's another buy one, get one deal or a trade-in offer. The trade-in offer is similar to Samsung's; you hand over a phone like the Galaxy S7 or iPhone 7, and AT&T will give you a $300 pre-paid card. 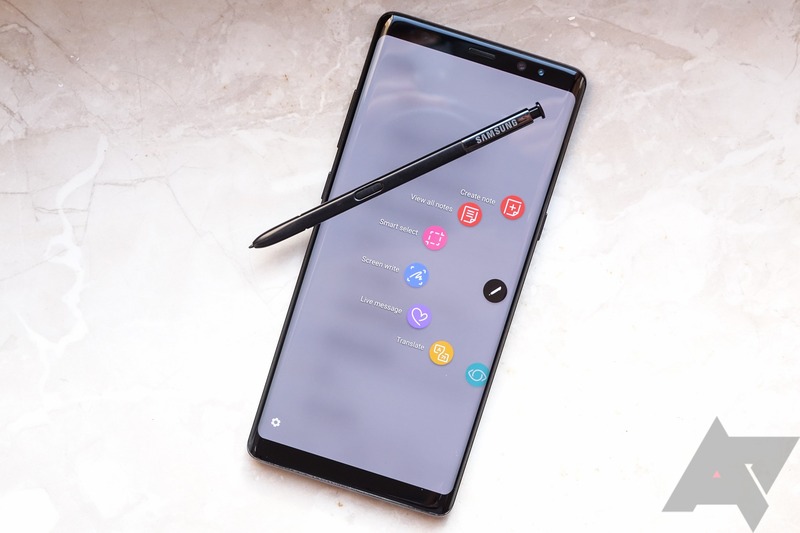 However, that card is only good at AT&T, so you should use it to pay off a chunk of the Note 8 you're buying. Your other option is a BOGO deal that's a little less generous than others. You buy two phones on AT&T Next or AT&T Next Every Year plans, and AT&T will give you bill credits every month that add up to $750. So, it doesn't quite cover the full cost of the Note 8, but it's overall better than the trade-in for a single device. The Samsung bundle? Yep, you get that, too. At Verizon, the Galaxy Note 8 will set you back more than the other carriers at $960 total. However, Verizon does offer an attractive trade-in option. If you give Verizon a high-value phone like the Galaxy S7, Moto Z Force, or Note 5, you get 50% of the phone's price ($480) back as a prepaid card 6-8 weeks later. You can use that to pay off a chunk of the device. For slightly cheaper phones like the iPhone 6 and HTC 10, you get $336 back. Another step down, and the Note 5, LG V10, or MTC M9 can still net you $240 back. The bundle is available to everyone here as well. Sprint is... well, Sprint is weird. There are no special deals for the Note 8 when you buy it at the regular $960 price. However, you can get a 50% discount on a Sprint Flex lease agreement. Instead of paying $40 for 18 months, you pay only $20. Remember, you don't own leased phones and must return or buy them at the end of the lease. At least you get that Samsung reward bundle. At Best Buy, you can get the Note 8 for Sprint, AT&T, or Verizon. The unlocked one is listed as well. You can take advantage of all the same deals from the carriers listed above, with the exception of T-Mobile (no Tmo phones at Best Buy). The Samsung bundle of a Gear 360 camera or a 128GB microSD card and fast wireless charger is available, too.